This message was sent by proclus@gnu-darwin.org via http://addthis.com. Please note that AddThis does not verify email addresses. 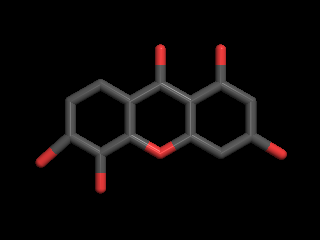 1,3,5,6-Tetrahydroxyxanthen-9-one AIDS-011165 AIDS011165 Xanthone der. Just some initial notes here. More to come I would imagine. I was surprised to learn tetrahydroxyxanthone from mangosteen can be used in solar cells. It appears to be a resveratrol-like polyphenol. I thought you might be interested in this opportunity to protect America's wild salmon from short-sighted mining operations. http://online.nwf.org/site/Advocacy?s_oo=FDp5jZ3twHsxT_H_tWJEvA..&id=915 If the text above does not appear as a link or it wraps across multiple lines, then copy and paste it into the address area of your browser. You've probably heard about the flooding in Pakistan that's left millions of people homeless. But did you know that similar weather disasters are expected to become more frequent and more damaging because of global climate change? Get the facts about the link between global warming and extreme weather. It's up to people like you and me to get educated and get involved -- so let's start today. 1. It is imporant to keep the GOP marginalized. 2. Keep the based engaged. Most of the courts are GOP friendly at this time. 4. Undermine their sources of economic strength. generation. We can do it, if we do it now, while they are weak. Walter Pincus reported recently in the Washington Post that the Pentagon is planning to build long-term U.S. military bases in Afghanistan. What I want to know is why do people read the Times at all? There are far better and far more accurate sources of news (hint!). I do not read it, and I do not link to it, which is the advisable course of action. Public Citizen is keeping an eye on Washington -- and beyond -- for us. http://action.citizen.org/signUp.jsp. You'll find out how we can take back our democracy. Greenpeace has sent a ship to the Gulf to do an independent assessment of the possible damage done to the sperm whale population. Hopefully, people like Dr. Lubchenco make sure the next disaster never happens. The war in Afghanistan has re-emerged as a major news story, thanks to the controversies surrounding the removal of Gen. Stanley McChrystal and the WikiLeaks release of classified documents. But on NBC's Meet the Press, the opportunity to engage in a robust debate about the war has taken a back seat to promoting the views of the military and supporters of Obama's Afghanistan policies. The most recent example came on August 15, when Meet the Press devoted the entire episode to a profile of Gen. David Petraeus. Host David Gregory's opening indicated it wasn't going to be a feet-to-the-fire interview: "At 57, General David Petraeus is easily America’s most famous warrior. On this morning we find him in the middle of physical training as this fiercely competitive four-star general works over soldiers half his age with the same intensity as he works the war plan." General Petraeus is a military leader with great commitment and great intellectual rigor, but you have to wonder whether he has enough time politically to achieve what he thinks is possible here.... The question now for the American public is whether it has the stomach and the will to do what it takes to succeed here, and whether it has the stomach for what could happen here if the U.S. and its allies fail. The hour with Petraeus was in keeping with recent patterns on the show. Right after the WikiLeaks disclosure, the show's August 1 broadcast led with Gregory announcing, "The leaking of secret Afghanistan war documents has enraged U.S. military officials who warn of serious consequences for the leaker and the man behind the Web site WikiLeaks." The featured one-on-one interview was with Adm. Mike Mullen, chairman of the Joint Chiefs of Staff. There were no guests on hand to comment from an antiwar perspective. On July 11, the program featured a one-on-one interview with White House press secretary Robert Gibbs that touched briefly on the war. The show's panel discussion featured MSNBC host Rachel Maddow, who offered a somewhat mild critique of the war, mostly stressing that a withdrawal timeline improves the performance of the Afghan government. Her co-panelists were conservative pundit David Brooks and Ed Gillespie of the Republican State Leadership Committee, both of whom support the war effort to varying degrees (Brooks called himself a "strong supporter," while Gillespie opposes any talk of a withdrawal timeline). On June 27, Meet the Press devoted significant time to Afghanistan, thanks to the McChrystal controversy. The one-on-one interview was with Republican Sen. John McCain, a die-hard supporter of the war who opposes a withdrawal timetable. The panel discussion that followed was notable in that it featured a rarity: a bona fide anti-war voice in Rep. Barbara Lee (D-Calif.). But Lee was surrounded by pro-war guests: writer Sebastian Junger, retired U.S. Army captain Wes Moore, retired general Barry McCaffrey and Tom Ricks of the Center for a New American Security. Any talk of leaving Afghanistan was outnumbered by the pro-war majority. Junger stated that if U.S troops leave, the Taliban are "going to be right back in Afghanistan." Ricks added, "I think if you want an endless war, Congresswoman, leave Afghanistan right now, and you'll find us having to go after Al-Qaeda again and again there for decades." At one point Junger even objected to Lee's terminology, arguing that "the word occupation really is not accurate." So in weeks when public support for the war has continued to drop (CNN's most recent poll shows 62 percent oppose the war--8/6-10/10), why has NBC been so intent on promoting the war? It is hard to overlook the fact that NBC's parent company General Electric is heavily involved in weapons-related contracts with the U.S. military, and has also benefited from reconstruction contracts in Iraq and Afghanistan (Center for Public Integrity, 10/31/03). On one recent show (7/11/10), Gregory mused that "finding the ideological fault lines here are difficult between left and right, frankly." But the host of Meet the Press can't "find" a debate only because he refuses to have one on his show. A very interesting social bookmarking site! Big Cypress National Preserve was created in 1974 to stave off a proposed airport in the heart of the western Everglades. Now Miami-Dade County, whose land surrounds the preserve, finds itself with a cash shortfall and a proposal has been made to squeeze the money it lacks for airport expansion out of the very nature preserve that was set aside to prevent new airport construction - Big Cypress. Under the proposal, Miami-Dade County would lease out the land for oil drilling — a cynical, grasping move that would undermine decades of preservation and be certain to hurt Florida panthers. Already one of the most endangered species on the planet, panthers depend on Big Cypress for living space. For now, the proposal has been shelved at the last minute by Miami Mayor Carlos Alvarez due to public outcry. But though it won’t be discussed at the very next county commission meeting, this destructive plan could still be brought to life again. And we need to make sure that doesn’t happen. So please, send a letter asking Miami's mayor to make sure this absurd and destructive idea to allow new oil operations in the Big Cypress National Preserve remains completely off the table. Visit http://salsa.democracyinaction.org/o/2167/t/5243/p/dia/action/public/?action_... to take action now. If I had to destroy a small glob of cells (#embryo) to get my stems cells, I would obviously do it. An embryo is not a human being, and far from it. A potential human being is not a human being, just a grain of pollen or a seed is not a tree. Meanwhile there are actual crimes against real human beings happening. Where is the sense of scale? There is real illness and actual human suffering, beside which that glob of cells is comparitively nothing. Outside the womb, the embryonic stem cells are a possible relief to some of this illness and suffering, and we have so much to learn about it. I gravely doubt the moral sensibilities of anyone who would block our access to stem cells and stem cell research. Many of them are all too happy to see the bombs raining on other countries, deprive others of basic human rights, and some of them are blind to the suffering they are causing. They have no credibility whatsoever to judge the ethics of stem cell research. It is a crime to deprive people of the option of embryonic stem cell therapy, which could possibly relieve their suffering. Come into the new millenium folks! If it is not done in this jursidiction, it will be done elsewhere. In fact, it already is. Stem cells are a wave of the future. If the US does not get on board, they will lose the game. An interesting social networking site. I just asked my senator to support the Global Food Security Act, and I hope you'll do the same. One billion people -one in every six - are suffering from hunger, a problem that will only get worse as climate change makes weather less predictable and farming more difficult. Women and children are often the hardest hit by hunger. In 2009, hunger and malnutrition contributed to the death of more than 3 million children. I understand that there is some controversy about language in the bill regarding GMO food research. It is clear that more GMO food research is needed, but perhaps the language can be modified in response to the critics, and natural allies will join in supporting the bill that they now oppose. No one should have to go hungry, and we have the tools to address global food security head on. Can you help me by taking action? http://act.oxfamamerica.org/site/Advocacy?s_oo=Y-wLrZZRAJ2RnX_vEW-_mg..&id=1151 If the text above does not appear as a link or it wraps across multiple lines, then copy and paste it into the address area of your browser. [FSF] Delivering the ACTA petition: Sign before Thursday to have yo ur voice heard! Subject: [FSF] Delivering the ACTA petition: Sign before Thursday to have	your voice heard! (DRM), also known as digital handcuffs. schedule...the next week could decide the fate of ACTA." signatures -- to the ACTA negotiators. Did you know that coal companies dump more than 130 million tons of coal ash, containing toxins like arsenic, chromium, lead and mercury, into the air every year? There are next to no federal regulations on it -- it's loosely regulated on a state-by-state basis. In some states, it's less regulated than household waste. All too often, coal ash gets dumped into our landfills and waste ponds -- and from there it leaks into our drinking water and fragile ecosystems. Right now, the EPA is considering options that could either reel in Dirty Coal's assault on the environment or maintain the status quo. I just signed a petition demanding the EPA say no to the status quo! I hope you will too -- it just takes a second. http://action.lcv.org/site/Advocacy?s_oo=lR-jlokCit_FNtFXPBdJoQ..&id=519 If the text above does not appear as a link or it wraps across multiple lines, then copy and paste it into the address area of your browser. Pakistan has asked that the U.S. immediately provide more helicopters that are urgently needed to save victims of the flood disaster that has affected 14 million people. The U.S. military says that it has helicopters in Afghanistan but that redirecting them requires a political decision in Washington. What Will It Take to Save the Arctic? Last month a federal lawsuit brought by the Center for Biological Diversity and our allies stopped a flawed and illegal Bush-era plan to drill in the Chukchi Sea. But no matter how much evidence piles up against drilling in the Arctic, Interior Secretary Ken Salazar keeps pushing ahead. Given the disaster we've seen in the Gulf of Mexico, there's no reason to run those same terrible risks in the Arctic. The stakes are simply too high. The inadequate and illegal Arctic drilling plan that is currently in place dramatically increases the odds of a large spill. Last week, the Canadian government produced a report finding that it would take three years to cap a blown-out well in the Arctic.The disastrous BP blowout in the Gulf of Mexico spewed a vast amount of oil into the ocean in just three months before it was finally stopped. If a similar disaster happened in the Artic, the situation would be far worse. This should never be allowed to happen again. Despite all the warning signs, Secretary Salazar continues to ask the courts to allow oil companies to go forward with their Arctic drilling plans. Please join the Center in telling Secretary Salazar that the Arctic is too important to sacrifice to America's addiction to oil. Visit http://action.biologicaldiversity.org/p/dia/action/public/?action_KEY=4587 to take action now. Tell President Obama to take it up a notch! Hey - I don't know if you've heard, but the Millennium Development Goals Summit is coming up, and even though President Obama recently released a plan to address the MDGs, it still comes up short. What we really need is a global development strategy, one that will serve as a compass for efforts to end global poverty. Will you join me in telling President Obama to take it one step further? http://act.oxfamamerica.org/site/Advocacy?s_oo=0bcHE1lpY-G8iFdpJ8TxWQ..&i... If the text above does not appear as a link or it wraps across multiple lines, then copy and paste it into the address area of your browser. How Many Iraqis Did We 'Liberate' From Life on Earth? I don't like these types of analyses because the always seem to neglect the harm that was done by years of sanctions and bombings during the Clinton presidency. Obviously, this is no defense of what happened in the Bush years, but neglect of the harm that was done in the Clinton years brings suspicion of partisanship. Clinton paved the way for Bush in Iraq by decimating the country's infrastructure and demoralizing the people, and the damage and loss of life that occurred in those years is likely comparable to the invasion and occupation. Michael wants you to take action on "Tell the FDA to Come Clean About Gulf Seafood"! Hi, I just signed the petition "Tell the FDA to Come Clean About Gulf Seafood". I'm asking you to sign this petition to help us reach our goal of 15,000 signatures. I care deeply about this cause, and I hope you will support our efforts. The climate crisis is getting worse, so we have to redouble our efforts and keep fighting. Al Gore is holding a special Virtual Town Hall on Tuesday, August 10 at 8:30 p.m. EDT, 7:30 p.m. CDT, 6:30 p.m. MDT, and 5:30 p.m. PDT on potential next steps for the climate movement. Another great source of GNU-Darwin related news is our SourceForge news roll. Last week NRDC celebrated a major victory when a federal court stopped oil and gas companies from drilling in Alaska's Chukchi Sea -- one of our nation's two Polar Bear Seas. But that ruling does NOT apply to Shell's plans for drilling off the coast of the Arctic National Wildlife Refuge in the Beaufort -- the second of the two Polar Bear Seas. Please watch my new video about this critical issue. President Obama has stopped Shell's offshore drilling for this drilling season. But Shell will be back next summer, sinking its drill bits into the Beaufort Sea -- unless you and I apply overwhelming public pressure to stop them. We can't afford a repeat of the Gulf oil spill disaster in America's Arctic. That's why, after you watch my video, I need you to join me in signing our Petition, which urges President Obama to impose a seven-year timeout on offshore drilling in the Arctic. That reprieve is urgently needed so that scientists can carefully study the real risks of drilling in this most sensitive of all environments. You and I must act now to avert a disaster in the Arctic. Please tell President Obama to stand up to the oil industry and put the Arctic off-limits to offshore drilling for seven years. Thank you for fighting alongside NRDC to keep the Arctic wild and free. P.S. Time is running out. Shell has said they will apply soon for permits allowing them to drill next summer. Does anyone really believe that oil drilling in the Arctic will be perfectly safe by next summer? A spill in the Arctic would be devastating to polar bears and other wildlife. Please watch my urgent video and then take action to help stop Shell. Thank you. http://www.nrdconline.org/site/Advocacy?s_oo=BMpFShm2sj6Ci5-hMJpkjg..&id=... If the text above does not appear as a link or it wraps across multiple lines, then copy and paste it into the address area of your browser. Did you hear the sad news? The House voted to keep spending trillions of dollars on the war in Afghanistan yesterday. I know, it's disappointing. But there is good news: more than 100 Democrats stood up to VOTE NO - more than triple the number who voted to end the war a year ago. Congress is changing it's mind about the war thanks to people like you and me. Which is exactly why we need to thank those members of Congress who VOTED NO and tell those members who voted yes how frustrated we are. I just sent a quick message to my member of Congress, can you do the same thing? It just takes a second, and it really makes a difference.